Plastic Garden Storage - Who Has The Best? 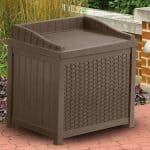 Plastic garden storage can be a practical and yet inexpensive solution for all your outdoor storage needs. High quality and durable storage can cost less than you think, and when it’s made from plastic it can also be easier to install and maintain. There’s a lot of plastic storage options available for the garden, from storage boxes to miniature sheds and seating, so to help you find the one that’s right for you WhatShed have created this handy guide to the 10 best examples of plastic garden storage that can be bought online in the UK today. So what do we look for when compiling this list of the very best plastic garden storage? Price and value for money were prime considerations, as were appearance, durability and versatility, and of course the amount of storage space that they provided was also taken into account. 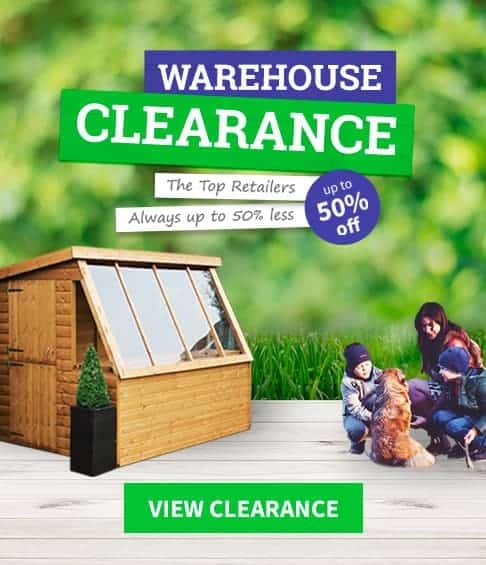 We were then able to select the number one plastic garden storage solution that can be bought online in the UK right now, along with nine diverse yet very high quality runners up. 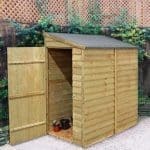 Plastic storage sheds come in all shapes, sizes and prices, but we managed to find ten high quality models for our WhatShed league table. 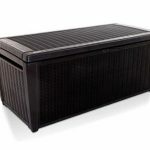 In what was a very competitive category we say well done to the Store It Our Midi Storage Chest, which thanks to its wood effect design and excellent value for money is named the best plastic garden storage that can be purchased online in the UK right now. Whether you’re looking for storage boxes or storage sheds, in plastic, wood, or metal, WhatShed bring you the independent reviews that can help you make an ideal buying decision every time. Plastic garden storage can come in many shapes and forms, and we’re glad to see that this top ten league table showcases many of them. We know, however, that despite the practicality and versatility that plastic brings, not everyone appreciates something that looks too obviously plastic in their garden. That’s just one area where this Store It Out garden storage chest scores very highly. The polypropylene cladding has been given a wood grain effect that is reminiscent of silver birch or yew, and is pleasing to the eye. It also has a good capacity available for a price tag of under a hundred pounds, and these factors combined take this to the very top of our list. With base dimensions of 1.30 x 0.74m you can fit a lot of gardening tools, equipment and accessories inside, especially with the front and the lid both opening up. It has a height of 1.10m which makes this the second tallest plastic garden storage facility in our top ten. If you plan on storing anything valuable inside then security becomes all important, of course, so we were pleased to find that a padlock isn’t included as standard a tough hasp is, making the fitting of one a simple task. We were also pleased to find that this comes with a two year manufacturer’s warranty rather than one, giving added value to what is already a very good price. 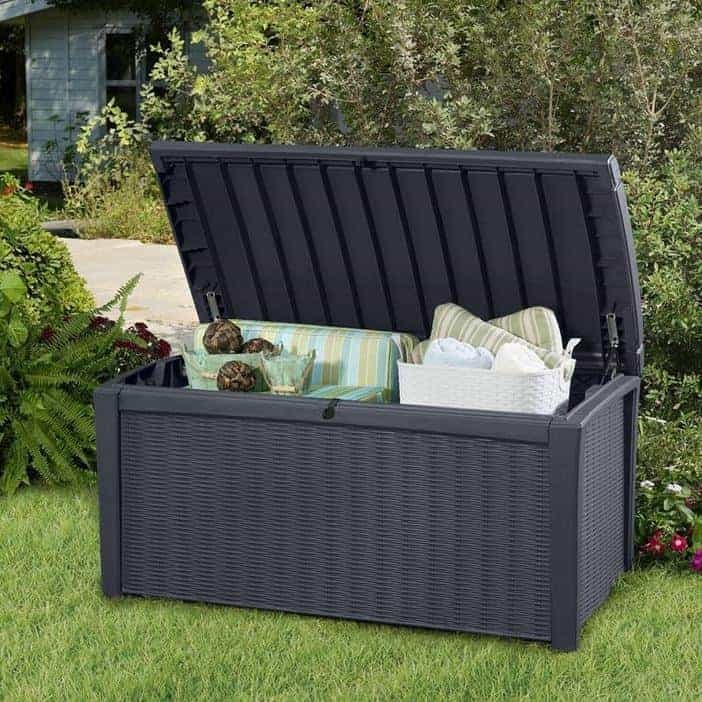 If you think that all plastic garden storage boxes look pretty much alike, this could be the model that makes you change your mind. It’s very attractive and caught our eye straight away with its attractive design. What makes it stand out from the crowd is that the side panels of the box have been arranged in a rattan style, and as this also has a dark charcoal grey colour the effect is very striking. If you’re looking for a large plastic garden storage box that can become a talking point for your garden, this could be just what you need. 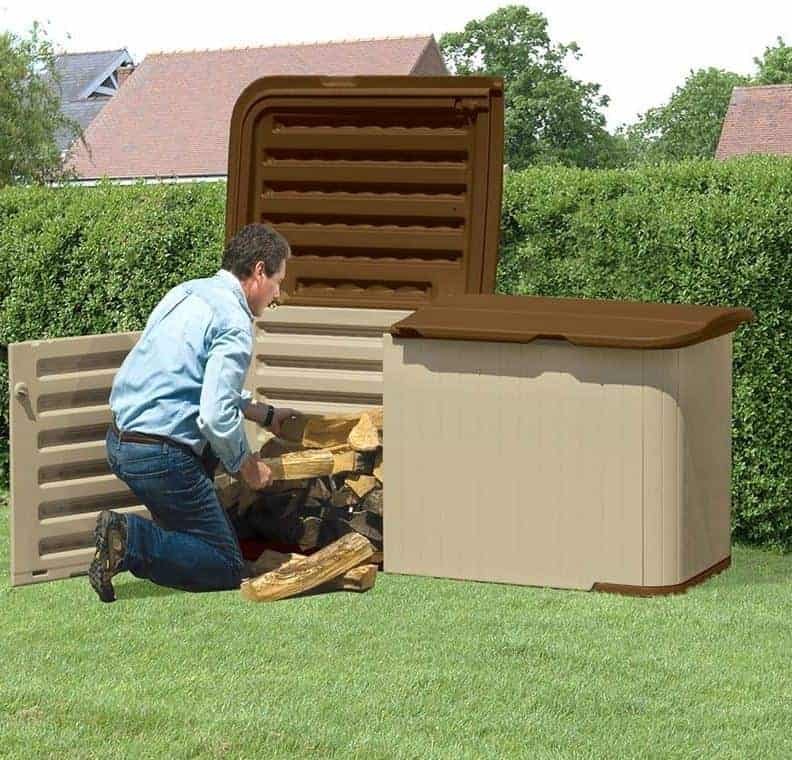 It has a very large storage capacity, measure at 400 litres, so it’s ideal for keen gardeners who have a more than average amount of tools to store away, but its generous dimensions mean that it can also be used as garden seating. Unlike some other storage seats we’ve reviewed this has room to spare with two people sat upon it, rather than feeling cramped. Another feature we liked is that it has an automatic opening lid, which can be especially useful if you’re trying to gain access when your hands are full. It also means that it won’t accidentally shut on your hands when you’re trying to store or retrieve items. Plastic garden storage doesn’t have to be large to be useful, as this attractive yet compact storage seat shows. 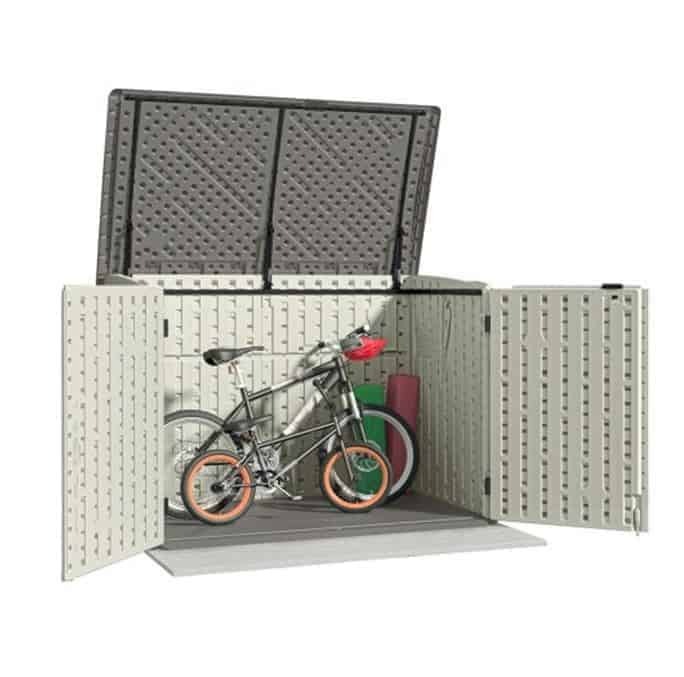 It’s small size, with a width of 0.57m and a depth of 0.45m with a height of 0.57m, can be an advantage for those who want a practical and yet portable storage facility. Being made of moulded plastic, it’s very lightweight. This means that you can easily pick it up and take it with you wherever you want to go. For that reason it can be sited on the lawn, on a deck, or even next to a caravan at a camping park. Because it’s made of plastic, it’s naturally flame retardant which means that it will comply with the regulations that most caravan parks have. Despite its modest size it should still be comfortable and stable when sat upon, which shows how tough the construction of the seat actually is. This is confirmed by the inclusion of a five year manufacturer’s guarantee, which we were very impressed to see provided with such a low cost plastic garden storage solution. In fact, this is the cheapest of all the entrants in our top ten league table, which is another reason that it earns a place inside our top three. This is another large plastic garden storage chest, with a very accommodating storage capacity of 390 litres. This is ideal for garden usage of course, as it is wide and long enough to take a large selection of tools including rakes and hoes, or alternatively bags of soil, compost, and aggregate. It can also be used, however, for the storage of cushions or toys for the children and grandchildren. Whatever you use it for, you can be sure that the solid plastic resin will keep the contents dry. We were pleased to find that it was padlock ready as well, as security is always important with any form of garden storage. With a price of just over one hundred pounds it makes large and reliable garden storage available to just about anyone, and of course being made of plastic you won’t have to spend any time or money on treating it with preservative as you would with wooden storage boxes. 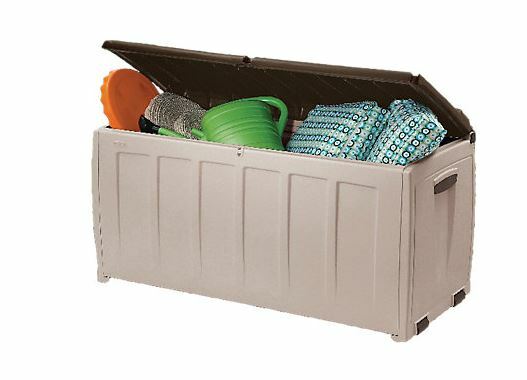 It’s this great value that carries this garden storage box into the upper half of our top ten. Another feature that we liked is that the lid has a slight curve to it, which ensures that rainwater is naturally and swiftly carried away rather than being allowed to sit on the surface. This is especially good news if you plan on sitting on top of the box, as it should make a comfortable and spacious seating for two people. This is substantially different from any other plastic garden storage in our WhatShed league table, both in its appearance and in its make up. That’s because it has a tough galvanised steel core, making this the heaviest of all the models to feature in this top ten, and yet that also gives it extra sturdiness and reliability. 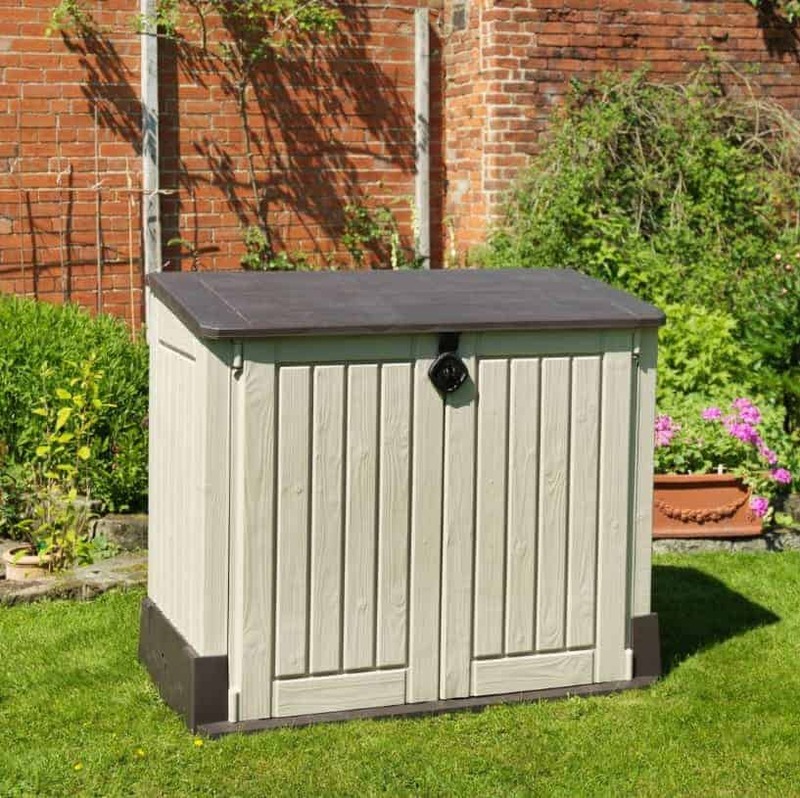 For this reason, it can be an ideal heavy duty storage solution for the garden and the proof of just how long lasting and durable it is comes with the manufacturer’s 20 year guarantee. We were very pleased to see such a long warranty period, as it shows how confident Biohort are in their own product. 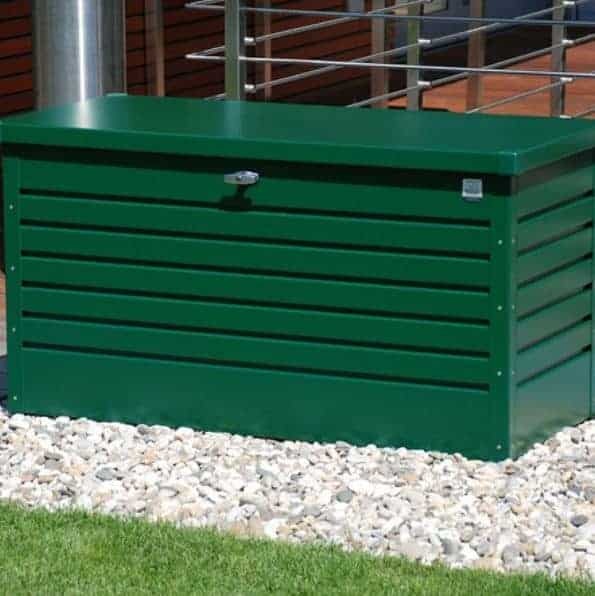 Whilst this is at heart a metal structure, it is polyester coated, and this is why we included it along with the more traditional plastic garden storage facilities. It’s the plastic covering that makes it so resistant to rust, and that gives it a very eye catching dark green colour scheme that reminded us of the always popular British Racing Green. It’s the most stylish garden storage box that we’ve seen, and it’s also very secure as it comes with an integral key operated lock. Only the higher than average price tag stopped this being placed even further up our list. A plastic garden storage facility that can also be used as a seat is fulfilling two functions in one; that makes it a very versatile garden structure and one that’s becoming increasingly popular. 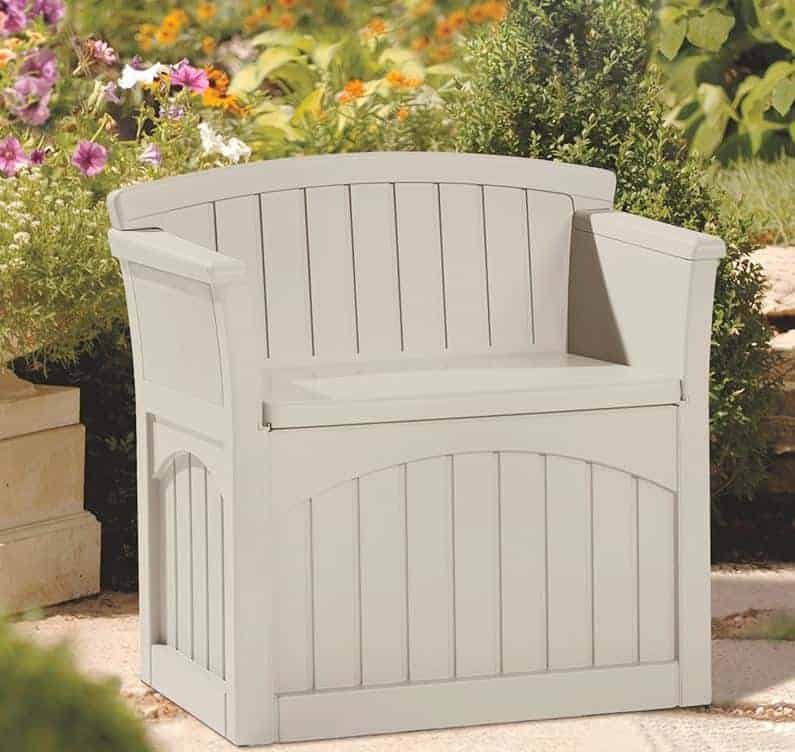 We’ve reviewed lots of plastic garden storage seats, and yet this low cost model from Suncast is one of our very favourites. That’s because it takes the basic design of a box that can be sat upon and develops it so that it’s not only functional, it looks great too. By adding two arms and a back it borrows stylistically from traditional park or garden benches, and yet it’s much more durable and maintenance free thanks to its plastic nature. This is likely a comfortable plastic garden storage seat to sit upon, which is especially important if you’ve had a hard day gardening or if you’re not as young as you used to be. It comes with a five year warranty, which is something that we’re always happy to see, but we wouldn’t be surprised to see it last much longer than even this generous warranty period. The 117 litre storage capacity makes this far from one of the larger models to feature in our league table, and yet we feel it still holds enough to make it useful for most small to medium sized gardens. If you need a plastic garden storage facility with a lot of space and a lot of width, then this could be the ideal solution. Its peak height of 0.87m is nothing out of the ordinary, but it belies this by being the widest of all the models in our league table with a width of 2.24m. Backed up by a depth of 0.92m this makes this one of the most capacious plastic storage facilities we’ve reviewed, so you’ll be surprised at just how much can fit inside. What we liked most about this plastic garden storage is that it’s very easy to access and use. The lid lifts completely off, and as well as that the double doors at the front can be opened wide as well. 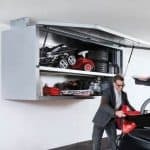 This makes it a perfect place to store wide and bulky items that may have difficulty being stored in smaller or more conventional storage facilities. Once again Suncast have provided a 5 year guarantee, and because this has extra strong walls that are an inch and a half thick it feels very strong and stable once assembled. Once again, it’s only the price that prevents this from taking a place in the top half of our top ten league table. This plastic garden storage box has a unique and original appearance that’s a lot of fun, and yet very useful as well. 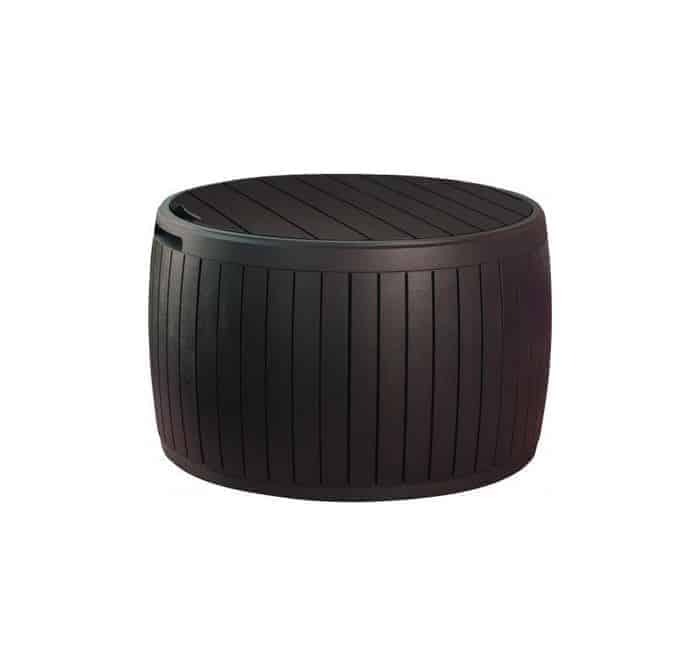 It has a round barrel shaped design with a flat lid, but it has also been given a wood effect design that makes it blend nicely into a traditional garden background. 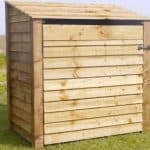 That makes this a smart choice for those who want a low cost, compact storage facility for their garden, and yet don’t want anything that’s going to look cheap or too obviously plastic. This plastic garden storage is also supremely portable and easy to move around, even when it has garden tools or equipment within it, and that’s because it has rollers on the underside. The lid is easy to use as well with built in handles. This is one of the smaller storage boxes that we’ve seen, with base dimensions of 0.44 x 0.60m and a height of 0.60m, but it’s also very inexpensive at a cost of not much more than fifty pounds. 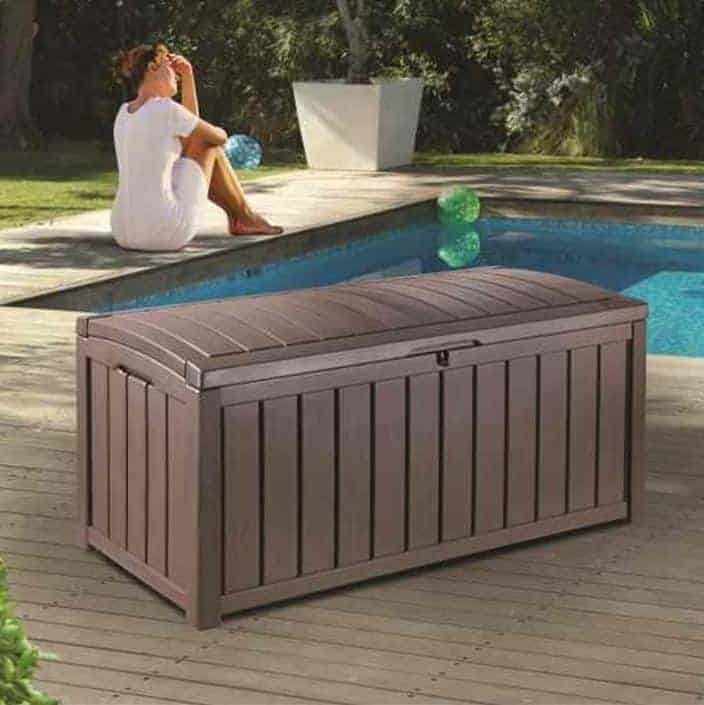 As it can also be used as a sturdy garden seat for one, this value and affordability is enough to gain it a deserved place within our league table of the very best plastic garden storage options that can be bought online in the UK today. Keter are a leading name when it comes to plastic garden storage facilities for two reasons: they are innovatively designed and yet very affordable. This model is a perfect illustration of these two very welcome factors. Firstly, it takes the standard plastic storage box and makes it even more flexible by adding four wheels. This makes it very easy to manoeuvre, particularly if it’s placed on a patio or decking area. Whilst the name suggests that it is designed for the storage of cushions, for which it’s eminently suited, its weather proof design makes it perfect for use in the garden, and because it’s easy to assemble and maintenance free you’ll have more time to spend on the gardening itself. 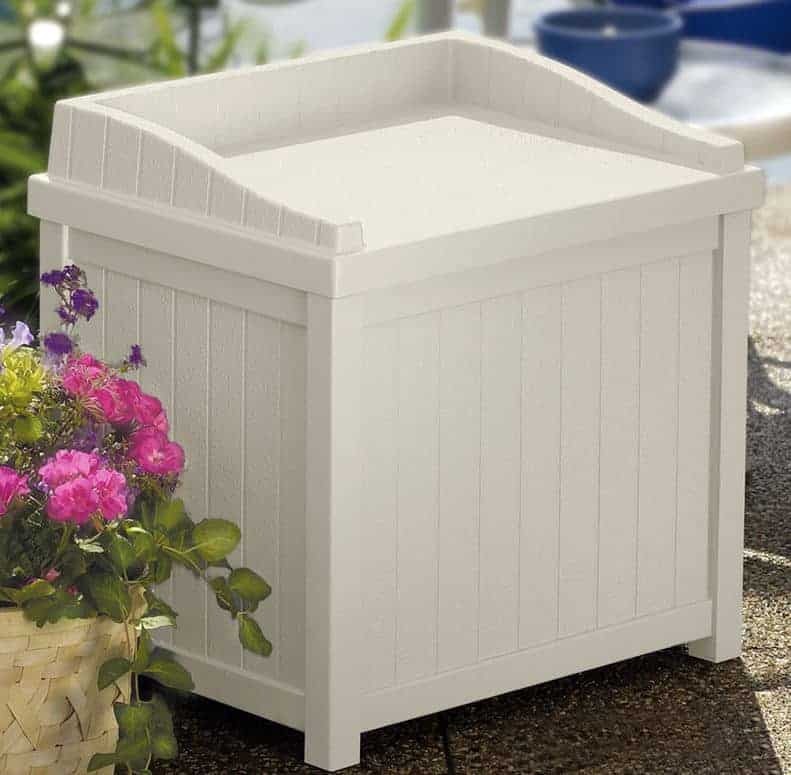 What we liked most about this plastic garden storage box is its excellent value for money in relation to the storage volume that it provides. This is certainly not a small and compact storage box, as its 340 litre capacity means that it can hold a lot of items underneath its lockable lid. For that size and volume, we feel that its asking price of less than fifty pounds is more than reasonable, and in fact this is probably the best value mid sized storage box that we’ve reviewed. It does, however, lack the sophisticated styling of some models, and this accounts for its penultimate place within our league table. From one of the cheapest entries in our plastic garden storage league table, we now come to the most expensive. It’s price tag of approximately five hundred pounds may put it beyond the budget of some, which is why it finds itself at the foot of our list, but it is still a very high quality garden accessory and its sheer size makes it very versatile as well. 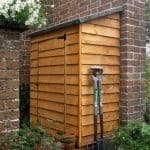 If your budget will stretch to this price and you need a large storage area that stops short of being a garden shed, then this should be at the very top of your shortlist. The scale of this plastic storage box was the first thing that grabbed our attention upon seeing it. It has a width of 1.55m, a depth of 1.16m, and a height of 1.34; this means that it can be used for so much more than gardening tools or bags of topsoil. We can easily imagine this being used to store a lawn mower or even a bicycle or two. Because the double doors at the front open wide, and the dark grey roof lifts up as well, there are no problems moving items of any size in or out. We were very impressed by this large storage box, and it even comes with an extending ramp at the front so that items can be wheeled inside.